Mark Bustos is a high-end hair stylist in New York City, working at a boutique salon where haircuts start at $150 and lots of clients are well-known celebrities. 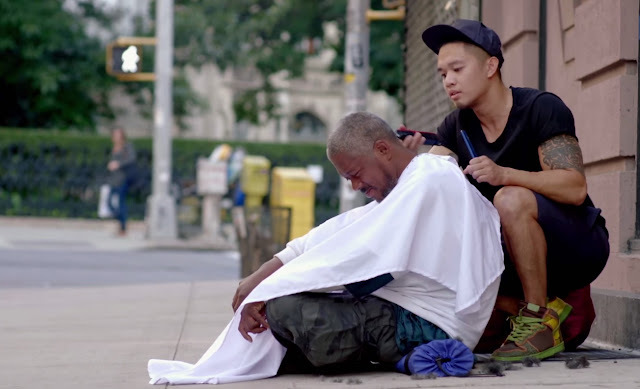 But every Sunday, on his only day off, Mark hits the streets of New York City to give back to his community, offering free cuts to the homeless. Mark’s parents are from the Philippines, but he was born and raised in the heart of New York City. At the age of 12, Mark travelled to his parents’ home country and was exposed to the extreme poverty of a third world country for the first time. In 2012, Mark returned and paid a local barber in his family’s province to use the space beside him for a day. He then invited the less fortunate children of the community to come in for a free hair cut. That day filled him with an amazing feeling that he could not forget. He decided he wanted to bring it back home.